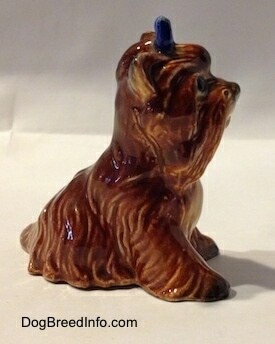 This is a vintage Yorkshire Terrier dog figurine by Goebel. This little girl has a blue bow in her hair and a smile on her face. She is hand painted with lots of details. On the bottom is the Goebel trademark 3 (TMK-3) logo of a small bee inside a V. The bee’s wings are below the top of the V. Around the V is an engraved circle. This mark was used between 1957 and 1960. Stamped in blue are the words by W. Goebel. To the left stamped in black it reads West Germany. There is an engraving that reads CH 598. 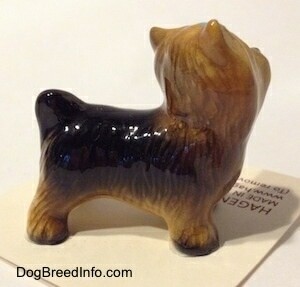 Also engraved are a copyright symbol (C) and the date 1958. 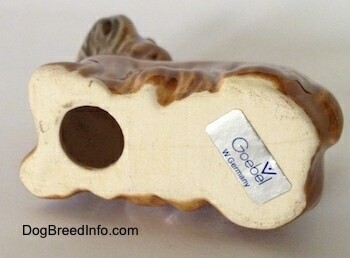 The date indicates when the mold of this piece was first made. 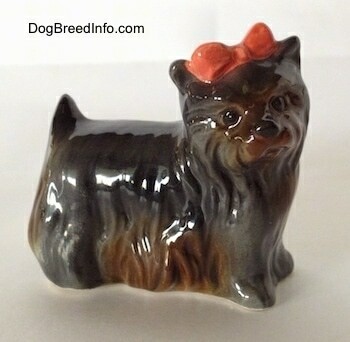 This means that this particular Yorkie was made between 1958 and 1960. She is in excellent vintage condition. 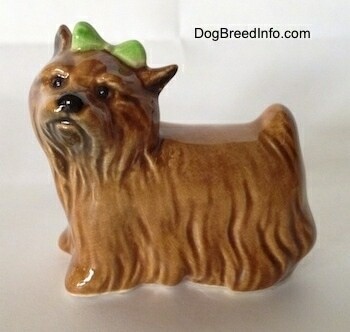 Vintage Yorkshire Terrier dog figurine by Goebel—image showing the Goebel trademark 3 (TMK-3) logo of a small bee inside a V. The bee’s wings are below the top of the V. Around the V is an engraved circle. This mark was used between 1957 and 1960. Stamped in blue are the words by W. Goebel. To the left stamped in black it reads West Germany. There is an engraving that reads CH 598. Also engraved are a copyright symbol (C) and the date 1958. 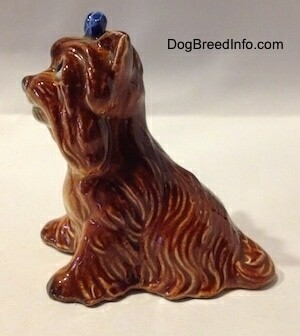 The date indicates when the mold of this piece was first made. 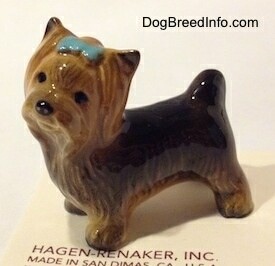 This means that this particular Yorkie was made between 1958 and 1960. 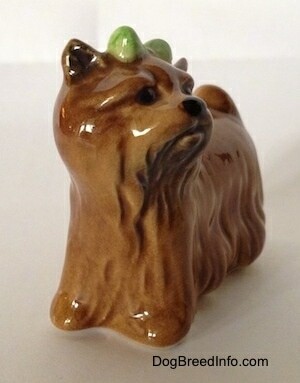 Adorable vintage Yorkshire Terrier dog by Goebel—this figurine was made in the 1970s. 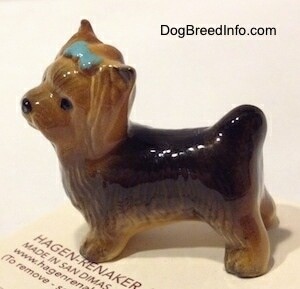 The coloring of this pup is of a steel blue and tan dog. She has a red bow on the top of her head. On the lower back side there is an engraved number that reads 509. 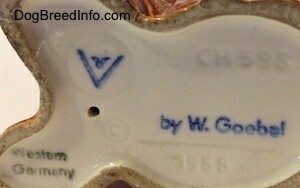 On the bottom is the original silver V with the bee Goebel sticker with the country W. Germany printed below the name Goebel. 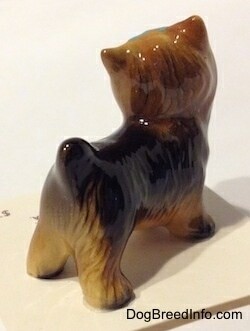 This little girl stands 2 inches tall, 2 1/2 inches long and about 1 inch wide. She is in excellent condition with no chips, cracks, breaks or repairs. There is no crazing. Nice glossy finish. 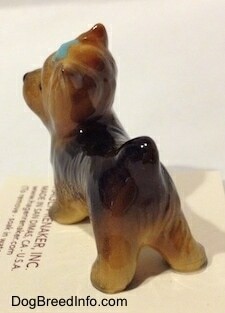 Vintage Yorkshire Terrier dog by Goebel from the 1970s—bottom view showing the original Goebel sticker with the country W. Germany below the word Goebel. The logo has the V with the bee inside of it positioned above the 'bel' in the name Goebel. This logo layout indicates the piece was made between 1972 and 1978. 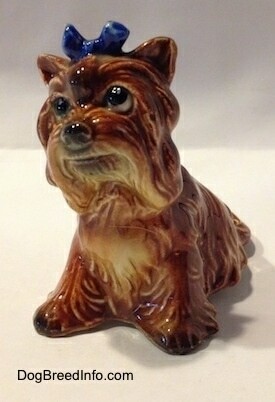 Sweet vintage Yorkshire Terrier dog by Goebel—this figurine was made in the 1970s. 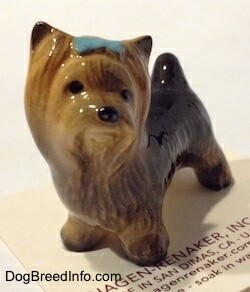 The coloring of this pup is tan. She has a green bow on the top of her head. On the lower back side there is an engraved number that reads 510. On the bottom is the original silver V with the bee Goebel sticker with the country W. Germany printed below the name Goebel. 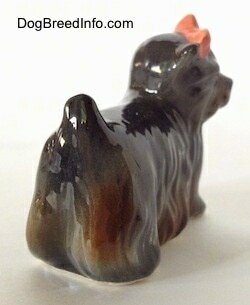 This little girl stands 2 inches tall, 2 1/2 inches long and about 1 inch wide. She is in excellent condition with no chips, cracks, breaks or repairs. There is no crazing. Nice glossy finish. 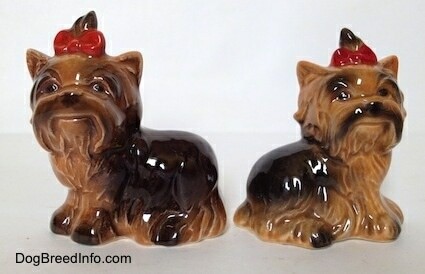 Pictured are two vintage Yorkshire Terrier dog figurines by Goebel. 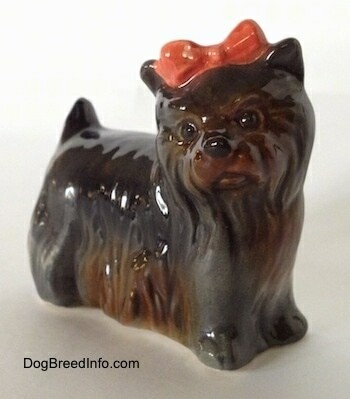 They are of small brown and black dogs in sitting poses with red bows in the top knots. 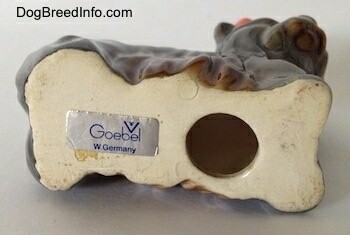 On the bottom of the figurines is the Goebel trademark 6 (TMK-6) logo of the name Goebel with W. Germany below it. 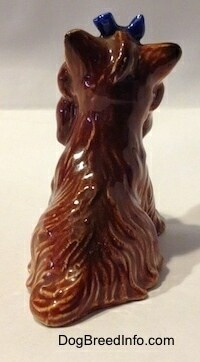 The mark sets the date of the figurines between 1979 and 1990. 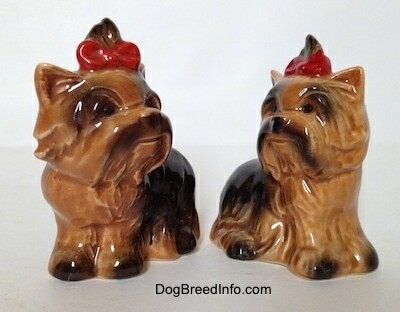 The dog to the left has a number stamp that reads 515 and the dog to the right has a number stamp that reads 514. 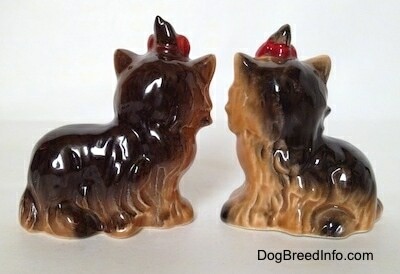 The dog on the left measures 2 5/8 inches tall from the ground to the top of the head, 2 1/4 inch long from the front paws to the base of the tail and 1 3/8 inches wide across the bottom from hip to hip. 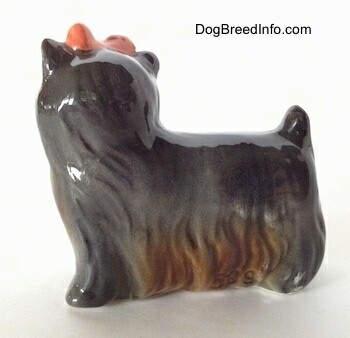 The dog on the right measures 2 1/2 inches tall from the ground to the top of the head, 2 1/4 inch long from the front paws to the base of the tail and 1 1/2 inches wide across the bottom from hip to hip. They were made in West Germany. 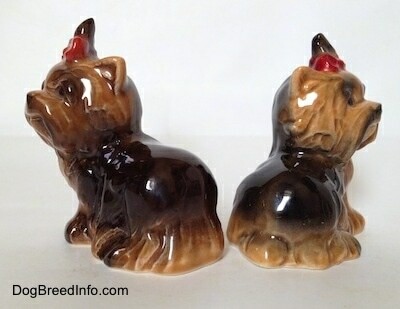 Two vintage Yorkshire Terrier dog figurines by Goebel—image showing the Goebel trademark 6 (TMK-6) logo of the name Goebel with W. Germany below it. 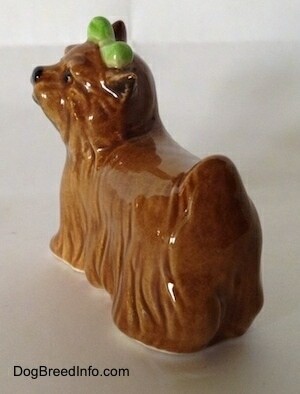 The mark sets the date of the figurines between 1979 and 1990. 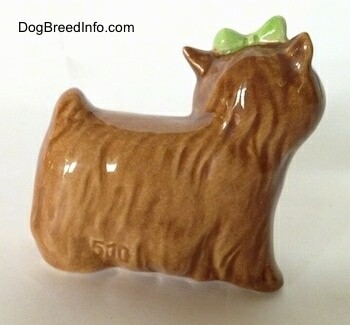 The dog to the left has a number stamp that reads 515 and the dog to the right has a number stamp that reads 514.